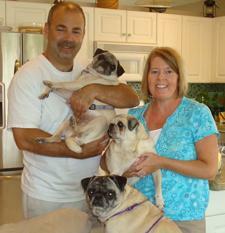 In this group picture, Brad holds Dixie and I hold Eddie. Sassie is in front. Dixie is doing great! She loves the routine that we have in our house. There are beds and comfortable spots for her to take a snooze whenever she wants. She loves to walk the neighborhood and try to keep up with her sister Sassie. She enjoys cuddling with her much older brother Eddie (all rescues from CPR). She is a really sweet pug who loves chewing on things (especially shoes) and getting belly rubs at any time of day. We are very lucky to have Dixie, she’s a beautiful little girl.